For the football fan who had everything in life and wants the same in death. You need no longer be content with having Simply the Best played at your funeral or having the ashes that the crematorium think might have something to do with you scattered at Fir Park. 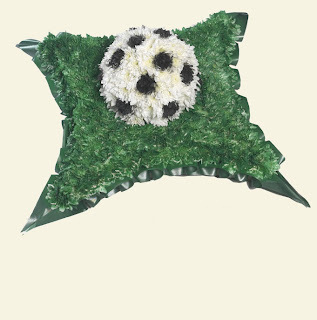 Now your coffin can be adorned with this aesthetically questionable (alright, absolutely dreadful) football shaped wreath. It’s from the Co-op and it’s made of chrysanthemums apparently. I’m not sure if they deliver to the walking dead but Steve McClaren can be found c/o The FA, 25 Soho Square, London.